Description: The only recording of this 1683 tragédie, remarkably popular with the public (not just the court audience) possibly due to its veiled criticism of the aristocracy, since Minkowski's 1994 Erato (now out of print). 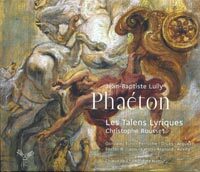 Critics have found it to be uneven but agree on the fact that when it's good, it's Lully's best, especially in its large-scale Chaconne at the end of the second act and the majestic depiction of the Kingdom of the Sun at the beginning of the fourth. 2 CDs in a 120-page bound book (regular CD size in height and width). French-English libretto. Emiliano Gonzalez Toro (tenor), Ingrid Perruche, Gaëlle Arquez (sopranos), Isabelle Druet (mezzo), Namur Chamber Choir, Les Talens Lyriques; Christophe Rousset.